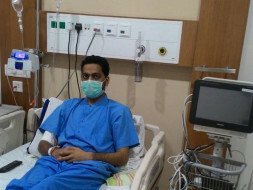 This is the story of Ashish Deshmukh who is presently undergoing a treatment for blood cancer (Acute Myeloid Leukemia). Ashish was my classmate/roommate and one of my best friends for four years during my Engineering studies in Nagpur, India. In July 2017, he was diagnosed with Blood Cancer. In the following 4 months he went through multiple Chemotherapy sessions which were successful and improved his health significantly. Since November 2017, slowly but steadily things seemed to be getting back on track, when last week during a routine checkup, it was found that the cancer had relapsed. Now his condition is critical and he immediately needs a bone marrow transplant which is planned to be carried out next month (May 2018) in Mumbai, India. The estimated expenses for Bone Marrow transplantation is 30 Lakhs (USD 45000). 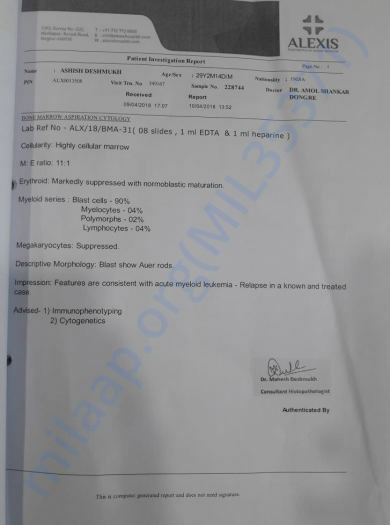 He belongs to a middle income family from a small town in India and in these last nine months, the family has ended up spending all their life savings, an amount of 25 Lakhs (USD 38,000) in his treatment. The land and other property which the family had, is either already sold or is kept as a mortgage to obtain funds for Ashish's treatment. Due to lack of sufficient funds, his family is now forced to borrow from relatives and friends. Any contributions (small or big) would be very helpful to collect the necessary funds to carry out the operation. You are humbly requested to make your contributions here. You can also directly contribute at the below mentioned bank details. I also request you to spread this message as much as possible to your known ones. The total contribution targeted is Rs 30,000,00 (USD 45000). In case you have any question or need further details of the case, please do not hesitate to contact me through this portal. After you get in contact with me by sending a message through this portal ( see FAQs for donors - https://milaap.org/crowdfunding/faq#faq_150), I will be more than willing to answer your queries personally over a telephone call. We want to inform you regarding the Ashish's health. Presently, he is at home and is continuing an oral chemotherapy treatment. Unfortunately, his cancer has relapsed and so we need to wait for the Bone Marrow Transplant procedure. We will keep you informed about his progress. Due to unexpected complications, the doctors are still waiting for performing BMT on Ashish. He is presently taking parallel medications, including oral chemotherapy. We will keep you posted regarding his improvement. Many thanks for your kind and continuing support!